When the problem in your roof goes beyond water stains and cracked shingles, and your roofing contractor in Sunnyvale has been showing up more times than you care, you might want to consider roof replacement, instead. What are your alternatives when your roof has outpaced its service life, and on the whole, is beyond straightforward repairs? 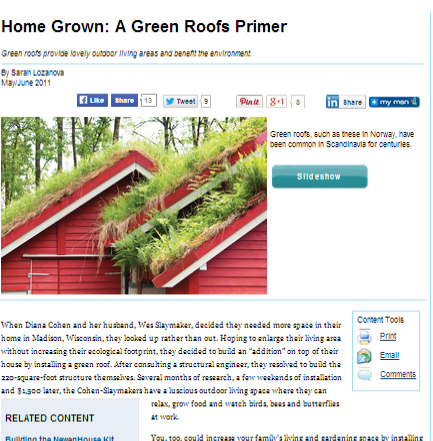 There is, of course, the obvious route of simple replacement, but for a growing number of homeowners concerned with their carbon footprint, there is green roofing. To go for green is to help reduce the urban heat island (UHI) effect in your own way. Sunnyvale, like any other city, can get as much as 10 degrees Fahrenheit warmer than its nearby more rustic areas. The concrete jungle, with its concentrated structures and dark asphalt pavement, absorbs light more that gets emitted as heat, thus, creating an island of heat around it. Furthermore, the need to power up air conditioners to cool up homes and establishments only aggravates the emission of greenhouse gas from power plants that supply the energy the city demands. “You, too, could increase your family’s living and gardening space by installing a green roof. Although modern green roofs are a fairly new concept, the idea of rooftop gardens is ancient. The hanging gardens of Babylon, a series of terrace gardens that are one of the Seven Wonders of the World, were constructed in 600 B.C. in what is now Iraq. Sod houses dotted the American prairie during frontier settlement, and green roofs have been scattered across Scandinavia for centuries. By introducing colors and vegetation on your roof, you help prevent the damaging impact of the urban heat island effect. The greenery that helps cool your home’s interior makes you live a more sustainable life where you rely less and less on energy consumption. The next time you call your reliable Sunnyvale roof repair contractor to your home for the umpteenth time, and he finally tells you to consider roof replacement instead, don’t despair. Consider rather just how viable—and refreshing—it would be to install a hanging garden on your roof.